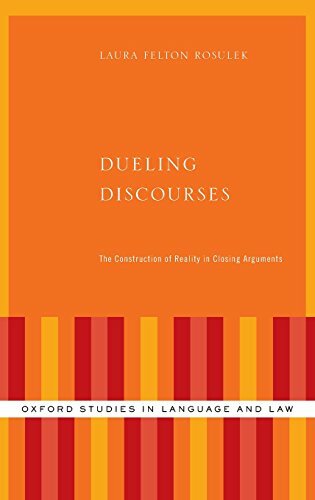 Dueling Discourses offers qualitative and quantitative analyses of the linguistic and discursive forms utilized by opposing lawyers in their closing arguments during criminal trials. Laura Felton Rosulek analyzes how these arguments construct contrasting representations of the same realities, applying the insights and methodologies of critical discourse analysis and systemic functional linguistics to a corpus of arguments from seventeen trials. Her analysis suggests that silencing (omitting relevant information), de-emphasizing (giving information comparatively less attention and focus), and emphasizing (giving information comparatively more attention and focus) are the key communicative devices that lawyers rely on to create their summations. Through these processes, lawyers' lexical, syntactic, thematic, and discursive patterns, both within individual narratives and across whole arguments, function together to create versions of reality that reflect each individual lawyer's goals and biases. The first detailed analysis of closing arguments, this book will significantly improve our understanding of courtroom discourse. Furthermore, as previous research on all genres of discourse has examined exclusion/inclusion and de-emphasis/emphasis as separate issues rather than as steps on a continuum, this book will advance the field of discourse analysis by establishing the ubiquity of these phenomena.